New Terra Farm Chicken Coop Plans Review . . . This product comes with plans to build several kinds of backyard chicken coops, and a 'chicken care' manual that is adequate to get you started raising your own backyard flock. Who could use this product: Any small property owner that needs a sturdy coop to raise a couple or a couple dozen laying hens. RECOMMENDATION This is a pretty good package overall, with the comprehensiveness of the plan and the quality of the graphics standing out. I would give it an overall rating of 4 out of 5, which would certainly make it a 'buy'. Over the years I have constructed a number of portable chicken coops and 'chicken tractors', and have also retrofitted existing buildings with chicken coops for our egg laying flock. So I thought it was time to have a look at chicken coop plans you can buy and download from the Net. I purchased the most promising-looking ones I found for this review; as always, I never recommend something I haven't bought or tried for myself. Readability of the plans. Are instructions clear and detailed? Can the plan be easily followed, by a builder with perhaps minimal experience in reading plans? Comprehensiveness of the plan. Does it cover every phase of siting and constructing your coop? Is there a list of materials provided? Is there a 'tools required' list? How good are the graphics?Are they easy to read with dimensions clearly marked? Do they detail every step of construction, including joinery? Do they include actual pictures of the completed coop? Ease of construction. I prefer to stay away from complicated joinery and intricate design details when I can. (I am the acknowledged master of 'half-fast' carpentry.) How easy will this coop be to build by someone with minimal-to-average carpentry skills? 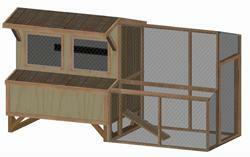 So how does the ChickenDIYGuides How To Build a Chicken Coop with Easy Step-by-Step Instructions. package stand up in this comparison? To start with, understand that these coop plans are intended for the 'backyard' chicken fancier who wants to raise a few hens for eggs. 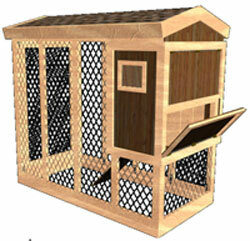 But if you are looking for chicken coop plans for a backyard coop, these are the best. 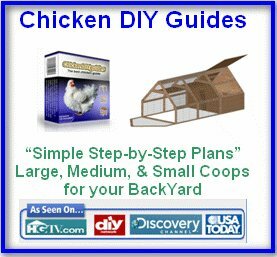 The Chicken DIY Guides plan actually includes plans and instructions to build a number of sizes and styles of coops, ranging from a small portable 'hen chalet' to a larger, permanently-installed coop suitable for a dozen or so birds. Readability and Ease of Construction. Readability: These plans are well laid out and easy to follow. Instructions are provided in logical sequence, with pieces constructed in appropriate order, e.g. situating the structure and constructing base frames before proceeding with other construction. Ease of construction.This is the one where I have a few quibbles with the construction methods chosen. The coops are (in my humble opinion) a bit 'overbuilt'; that is, the framing and details are a little excessive just to make a house for a few hens. And there are a few details I would just leave out e.g. the roof vent is just not necessary! There is nothing wrong with doing it the way the plans suggest, but there are simpler ways to accomplish the same thing. For example, rather than framing a window with mitre cuts and rabbett joints, I would probably scrounge a 'recycled' window already framed and adjust my plans to suit. These plans will build you good-looking, sturdy coops but at the cost of some extra work. Comprehensiveness of the plan. These plans are thorough, and include instructions from how to situate your coop to finishing details such as constructing roosting poles and nest boxes. Potentially tricky bits - e.g. 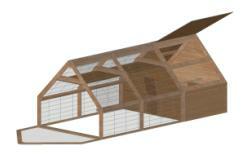 constructing roof trusses - are explained in detail, with diagrams. A list of material and a 'sheet cutting' list is provided to help you plan your work. There is no list of tools required per se, but the plan does explain when certain tools are required e.g. a framing square for laying out roof rafters. Graphics.The graphics provided with these plans are excellent, high quality graphics with dimensions clearly marked (feet and inches only, no metric equivalents given.) Photos of the completed coops and at various stages on construction are included. Bonus material.There is quite a bit of additional material included with these chicken coop plans. The material varies in quality from 'pretty useful' to 'not very helpful'. You get basic instructions on chicken care (pretty good), a chicken dictionary of terms (not especially useful), and access to some videos (somewhat interesting). A couple other items are also included, but don't add a lot to the package. This is a pretty good package overall, with the plan comprehensiveness and graphics standing out. I would give it an overall rating of 4 out of 5, which would certainly make it a 'buy'. From time to time I recommend books and software on this site that I believe will be of value to my readers. I only recommend products I actually own and find useful myself. And I only recommend the best I can find in that particular category of product.